At BRIDGE HOUSE we aim to give you a warm and hospitable Christian welcome, for whatever reason you come. We believe that God has made us all stewards of His creation, and given us all the responsibility to care for and share all good things. This is a part of the good news of peace with God through Jesus Christ, His son. We hope that at Bridge House we will offer you a place of warm Christian hospitality. We follow the prayer offices of the Northumbria Community, of which we are companions. Morning Prayer (about 9:00am), Midday Prayer (12 noon) Evening Prayer and Compline (times vary). You are welcome to join us for these Offices, but recommend that you contact us first to confirm times. At midday on Wednesdays (midweek) every week we follow a simple communion service to which you may simply turn-up, though again a phone call might prevent a waisted journey if we happen to have been distracted. We try to make ourselves available for people most of the day. If you would like prayer, a sympathetic ear, spiritual direction or just the chance to get away to the quiet of our grounds just contact us and we should be able to help. At BRIDGE HOUSE we try to pursue animal welfare and production processes which are environmentally friendly and promote a more sustainable future for society. Our products are made predominantly from home grown or local produce and free-range animal products. We use GMO free and organic ingredients and feed wherever possible. No artificial addatives or preservatives are used in most cases. We have a regular supply of Free Range Eggs from our chickens on the smallholding. We can produce a variety of home baked dishes such as Lasagne (meat or vegetable), moussaka, quiches, meat pies, vegetable pies, seasonal fruit pies, cakes, muffins, biscuits, jams and chutneys etc. We have a limited amount of seasonal fruit; apples, plums, pears and soft fruit. We usually make items to order. We make felt from our sheep's wool and can fashion this into a variety of items. Please talk to us about your needs and ideas. Brigid's Kitchen Tea Room has taken on a new format: Help Yourself.You will find tea and coffee making things in the shop and usually cake of some kind. Soft drinks and confectioary are also available. 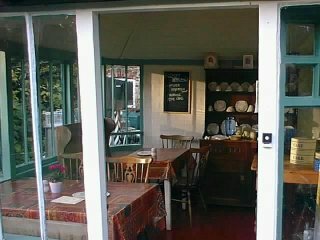 Just pop in and help yourself, then either sit in the tea room or garden or take away. More information will be posted as things develop. We have one double and one twin/double en-suite bedroom, both of which are available for B&B guests or for residential retreat guests. In addition we have bedrooms which can be available for residential retreat guests who are willing to live more in community with us and share in the working of the house (not quite as posh as the other rooms!!). Please contact us if you are interested in any of the accommodation we offer. We have set apart about an acre of our meadow for caravans and campers and we are in the Camping and Caravanning Club (CCC) Big Sites Book. We are able to offer usual facilities within 50 yards of the camping area or by the House. We have a five van licence and are restricted 15 other units so it is advisable to contact us before arriving to check we have space. We always try to make time to stop and talk, to met visitors and passers-by. But we also seek to make ourselves more specifically available if necessary. Whether it's just a sympathetic listening ear, or if you are looking for a spiritual director we hope we can help, either ourselves or through our contacts. 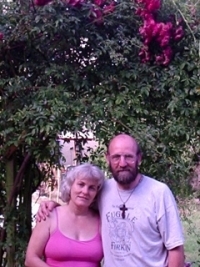 Philip is a trained Spiritual Director and works in conjunction with the Oxon, Berks and Bucks, Spiritual Directors Network (SPIDIR) and both Philip and Rosemary have been trained in basic listening and counselling skills. Rosemary tells the story of a visit by the Grayson family to the outer Hebrides. One day a visit to the Post Office was called for to collect the Family Allowance. The approach to the building, a small White House I believe, was inauspicious apart from the fact that there was no-one there. The Post Office counter was there, and open, but unattended. The small village store, which this building doubled as was similarly unattended. Several minutes later the "Post Master" appeared, having seen them arrive and walked in from his croft where he had been working. You see this man was not only the Post Master but also the shop keeper, the general supplier of miscellaneous goods and he and his wife no doubt made tweed and knitted sweaters when they weren't tending the animals, or the children or a myriad other jobs that they combined to make up their lifestyle. We are a bit like this at Bridge House and listed below are a number of other things we "do" which may interest you. Do visit our "Other Activities " page for a little more detail, but contact us direct if you think we may be able to help your particular need. "Sow's Ear" Barn Dance Band. In addition, we hold a variety of occasional events, courses and activities from time to time on a whole range of topics. See our "Events and Happenings" page for more details.